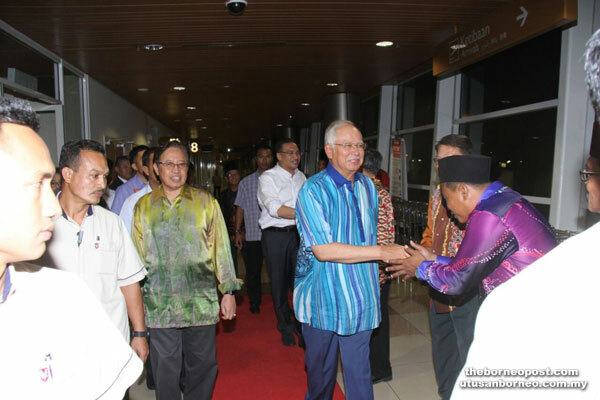 KUCHING: Prime Minister Datuk Seri Najib Tun Razak arrived here yesterday for an official visit to the state until tomorrow. He arrived at the Kuching International Airport (KIA) around 7.30pm, accompanied by Defence Minister Datuk Seri Hishammuddin Tun Hussein. On hand to welcome them were Chief Minister Datuk Amar Abang Johari Tun Openg, Local Government Minister Datuk Dr Sim Kui Hian, State Legislative Assembly speaker Datuk Amar Mohammad Asfia Awang Nassar, deputy speaker Dato Gerawat Gala and State Secretary Tan Sri Datuk Amar Morshidi Abdul Ghani. The Prime Minister has a busy schedule ahead of him today, starting with declaring open the new block of SJK Chung Hua No.4 at Jalan Nanas before proceeding to Dr Sim’s house at Jalan Wan Abdul Rahman in Kenyalang Park to pay him a Chinese New Year visit. In the evening, he will attend a briefing by Archbishop John Ha on the construction progress of St Anne’s Church in Kota Padawan as part of his walkabout programme before attending the Chinese New Year Ramah Tamah celebration at SJK Chung Hua in Mile 10, Kota Padawan near here. Tomorrow, Najib will be travelling to Lundu to officiate at the opening of Medan Selera food court in Lundu Town after which he will be participating in Friday prayers with local Muslims at Lundu District Mosque. He will then leave for KIA to Kuala Lumpur.